Today, I met with a student who is working on an awesome end-of-year project on center of masses. Basically, he’s making a bunch of semi-complex foam figures (with some other materials, like wooden dowels). He’s going to multivariable calculus to find the center of mass for these figures. Then he’s going to paint them black, mark the center of mass with neon orange, and toss them in the air while video taping it. He’s going to throw the video he makes of his own crazy figures into LoggerPro (but Tracker would work just fine) and see if he gets a parabola. One of his objects is going to be something like 2/3 or 3/4 of a foam torus. He was having trouble finding the center of mass of it. The first thing we did was simplify the problem — changing the 3D foam figure of uniform density into a 1D bent wire of uniform density. For the problem, we assumed 3/4 of a circular wire and we gave it a radius of 1. Then the question was to find the center of mass for this thing. Clearly it won’t be on the wire , so you can think of it as such: if you wrapped the wire in super strong but super duper infinitely light saran wrap, and then you wanted to balance this wire+saran wrap figure on a pencil point, where would you place the pencil point? So I’ll admit that I struggled — but not as much as I anticipated. I started from first principles when solving the problem (cutting the wire into a finite number of pieces, and then making a Riemann Sum). And then this method allows me to find the center of mass no matter how much of the torus I have, whether it be 2/3 or 3/4 or e/pi. I’m sure there’s an easy way to do this — much easier than reducing the problem to first principles and starting from scratch. But now that I have, I am pretty darn proud of myself. I think I understand the problem, now that I can look back at it, at a much deeper level. I can see symmetry arguments and how they come into play through the algebra, from working it out. I also can see how I can solve this sort of problem given any bent wire (any wire which I can describe parametrically, anyway). So yeah, I got a little bit… glowey. Immediately I wanted to convert to and have that cancel with the other in the integral. That’s when I realized my huge mistake… after 5 minutes of hunting. You can’t assume that . In fact, it equals . And this small distinction makes all the difference in the world! No, there isn’t any advice for you, and this isn’t about things I’m doing in my class, or even me fretting about how I’m not doing an amazing job. This blog also acts as a little digital archive, and I wanted to set aside this little glowey moment. And if you’re wondering, I’m going to let my student sweat it out, and keep on working at it, until we next meet. If he hasn’t had that moment of insight yet, I’ll help him out. PS. If you want to work out this problem or any variation, and come up with some beautiful and elegant solution (which y’all are oh so amazing at!!! ), feel free to throw your thoughts/approaches/etc. in the comments. What he’s going to do, in order to throw it, is to put two or three light toothpicks in this partial torus, with a neon orange sticker attached to the toothpicks where the center of mass is calculated to be. I don’t know if the LaTeX renders, but hopefully it can be followed. Otherwise, quick summary: Treat this problem in the complex plane where the parametrization is particularly easy, i.e. a complex exponential, which I is a piece of cake to integrate. Wow, talk about elegante! That’s super nice. I wish I had taken a course in complex analysis, so I would have thought to do that. At first I thought our answers didn’t match, but they totally did. I think this same complex number argument shows that for any arc (say, of angle theta) the distance of the CM from the center of the circle is theta/2 * sin (theta/2). That’s much simpler than I would have expected! Maybe with an absolute value in there somewhere too! Did you ever find out the answer for the center of mass of a solid toroidal segment? I’ve given it a try, but there was plenty of room for algebraic error, and I’m not 100% certain I got it right. oops. that wasn’t directed to Joshua, but to samjshah… I hit reply in the wrong place. Hi @peeterjoot, I love the work you’ve done with it on your blog! I never went as far as to calculate the “solid” center of mass — but I think it should be the same whether you consider a linear wire with some density or a thick torus, right? If that’s true, then my answer corresponds with @TheVirtuosi above — for 3/4 of a torus. Hmm. Compared to your result, it looks like I’m off by a factor of 2 in the limit r -> 0. I shouldn’t try to plug numbers into equations past 12pm. I get the same result as you and the Virtuosi after all for the circular wire segment. Note however, that this _is_ a different result than that of the solid torus, and it is only in the limit where the torus is very thin that this approximation holds. Pingback: Volume element for a toroidal segment. « Peeter Joot's Blog. 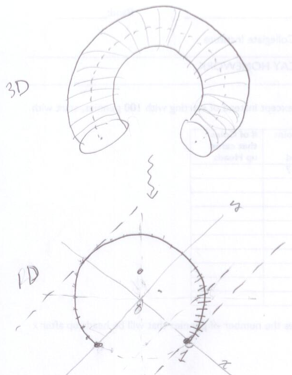 Pingback: Center of mass for a toroidal segment « Peeter Joot's Blog. Pingback: Center of mass for a circular wire segment « Peeter Joot's Blog.